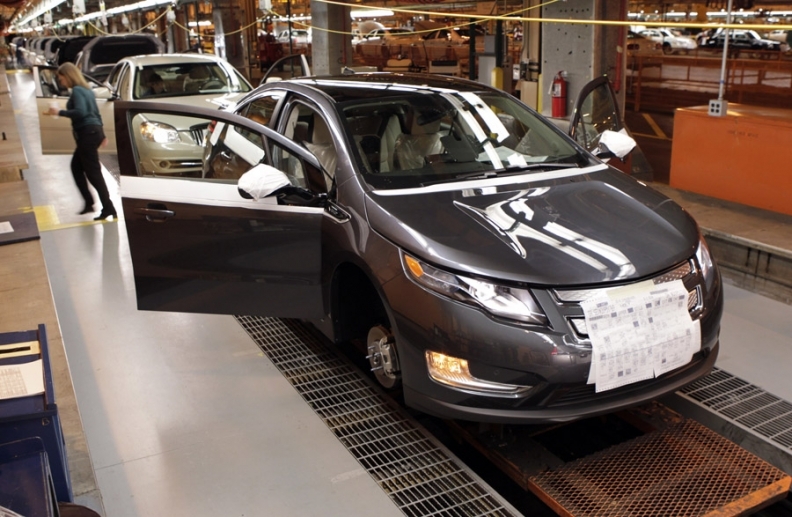 GM's spending on cars including the Chevrolet Volt plug-in hybrid, above, and future products may lead to higher costs similar to those that restrained 4th-quarter profits at Ford and Daimler AG. DETROIT (Bloomberg) -- General Motors Co. is expected to report its smallest quarterly profit in a year as costs for developing and introducing new vehicles rise. Fourth-quarter net income may be $1.06 billion, based on the average of seven analysts' estimates compiled by Bloomberg. The profit would be GM's second-weakest quarter since emerging from bankruptcy in July 2009, and better than only its $3.22 billion loss a year earlier. GM CEO Dan Akerson is demanding speedier introductions of new models as the automaker revamps a lineup that is older than rivals such as Ford Motor Co. GM's spending on cars including the Chevrolet Volt plug-in hybrid and future products may lead to higher costs similar to those that restrained profits at Ford and Daimler AG. "Both Daimler and Ford got pinched quite a bit in their fourth quarter due to higher launch costs," said David Whiston, an equity analyst at Morningstar Inc. in Chicago. "I suspect we're going to see something similar at GM." GM's fourth-quarter financial results will be released Thursday morning. The quarter still may be strong enough to help GM post its largest annual profit, excluding gains recorded when it emerged from bankruptcy in 2009, since its predecessor earned $6 billion in 1999. Net income in 2010 may be $5.38 billion, the average of five analysts' estimates. Fourth-quarter earnings will be lower than in earlier periods last year partly because of higher engineering spending, Chief Financial Officer Chris Liddell said in an interview last month. Automakers are paying more for materials such as steel and are struggling to pass the costs to consumers amid a "somewhat weak" economy, said Nicholas Colas, chief market strategist at BNY ConvergEx Group in New York. Ford said last month that fourth-quarter profit tumbled as new models generated higher costs. The profit margin for Daimler's Mercedes-Benz unit narrowed to 8.3 percent in the fourth quarter from 9.5 percent in the previous three months as development spending rose 15 percent. GM's ability to generate cash and its presence in China should offset those costs over time, said Dan Veru, chief investment officer at Palisade Capital Management LLC in Fort Lee, New Jersey. GM has said its cash flow could reach as much as $16 billion annually. "The mindset has changed, and they are investing for the long run," said Veru. "There is a universe of investors that is going to find that quite appealing." Revenue in 2010 may have climbed 27 percent to $133.3 billion, based on the average of 12 estimates. Sales were $104.6 billion in 2009, down from $205.6 billion in 2006, when GM had twice as many U.S. brands. GM lost 0.7 percentage point of U.S. market share from 2009, when it closed Hummer, Pontiac and Saturn and sold Saab, according to Autodata Corp. in Woodcliff Lake, New Jersey. Filling the void are the Chevrolet Equinox, Cadillac SRX and GMC Acadia sport-utility vehicles, and the Buick Lacrosse sedan. GM updated or replaced models representing 14 percent of its sales in 2010, trailing the 26 percent replacement rate for Ford, Chris Ceraso, an analyst for Credit Suisse Group AG, wrote in a report last year. GM's refresh rate will fall to 12 percent this year, compared with 19 percent for Ford, according to Credit Suisse. The shortage of new models coming to the U.S. this year may require GM to spend more on discounts and sales incentives than rivals, said Jessica Caldwell, an analyst at Edmunds.com, a Santa Monica, Calif.-based consumer auto-pricing website. "That's something you're going to have to do when you have old product and you're selling in the face of competitors coming out with new product," Caldwell said. GM increased spending on incentives by 16 percent in January, while Ford, Chrysler Group LLC and Nissan Motor Co. reduced them, according to Autodata Corp. in Woodcliff Lake, New Jersey. GM started a promotion this month offering to waive payments on existing leases if holders buy a new car, and the automaker is offering cash of as much as $7,000 on some Cadillac models this month, according to Edmunds. GM's incentives in 2010 fell 5.5 percent to $3,393 per vehicle sold, a bigger drop than the industry's 2.1 percent decline, according to Autodata. GM's operations in Europe, its only unprofitable region, are expected to lose money through 2011. The automaker needs a turnaround there similar to what was achieved in the U.S., said Stephen Girsky, GM's vice chairman. "It's a little tougher to do over there, given the excess capacity across Europe, but it can be done," Girsky said during a conference call with analysts in New York earlier this month. GM had $82 billion in losses from 2005 to 2008 before tumbling into bankruptcy in 2009.